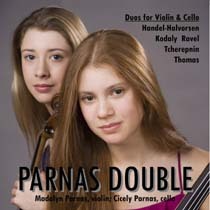 This debut recording for the Parnas Duo, Madalyn Parnas, violin and Cicely Parnas, cello, features well-known and well-loved staples of the 20th Century and a few delightful discoveries. Duos by Kodaly and Ravel, the giants of this sparse repertoire, are obviously included. But you may consider adding the Tcherepnin Duo written in 1932 to this short list after hearing this enchanting and often beautifully lyrical piece with its driving folk dance rhythms and energy. The romantic Handel-Halvorsen Passacaglia and a truly charismatic string duet by Jonah Thomas composed before and after the 20th century respectively, complete the listening adventure.